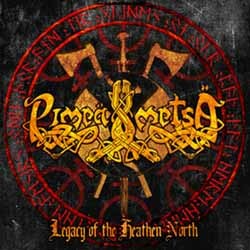 Spanish Viking folk metallers Pimeä Metsä have recently released their debut album. The band was formed in the end of 2006 in Madrid by a group of friends. They soon recruited more members and started working on the first songs. After some line-up changes, they made their first live appearance in the beginning of 2009. More line-up changes and live shows followed and finally on February 2010 Pimeä Metsä released their demo EP “Beneath the Northern Lights“. The band grew in popularity and some gigs with bigger names of the genre confirm it. They decided the time for their first album has come, so they soon started working on it. “Legacy of the Heathen North” was recorded and mixed at New Life Studios, in Madrid and mastered by Mika Jussila at Finnvox Studios. It was finally self-released on November 2013. The album begins with an impressive symphonic instrumental intro, short, but very beautiful. By the first riffs of the opening song “Warmarch of the Jotuns” you can understand that this is a very professional and ambitious debut album! The band moves somewhere between pagan Viking metal, classic heavy metal and folk metal. Nice epic rhythmic guitars, melodic lead guitars, discreet synths and traditional instruments like accordion and mouth harp, compose Pimeä Metsä’s solid orchestrations. They use only male vocals, most of the time in an epic Viking style, somewhere between clean and brutal. There are also a few more extreme vocals, as well as several epic choir parts, adding more variety in their music. Their overall aesthetic is closer to epic heavy metal than extreme metal and they have a very powerful, clear and technical sound. They don’t overload their orchestrations with traditional instruments, but add them wisely in a few selected parts, making the difference! This way they manage to keep a very powerful and clearly metal sound and at the same time their folk parts sound even more melodic. Except for the intro, there are several other short instrumental soundtrack-like passages, where the band is very good! Maybe they could explore even more this genre. “Legacy of the Heathen North” includes 11 tracks that move mostly in mid-tempo rhythms and it lasts for 55 minutes. All lyrics are in English, with only a few passages in Finnish, dealing exclusively with Viking mythology. Pimeä Metsä is for sure a very promising band, since they already have a quite personal, tight and professional sound, even if this is only their first full-length album. “Legacy of the Heathen North” is a decent folk Viking metal album that fans of the genre should surely check. It is self-released in a standard jewel-case edition with a 16-page booklet, including the lyrics. The booklet is designed by two members of the band, David Chas (rhythmic guitars) & Ángel Flores (vocals, mouth harp). You can visit the official pages of the band below for sound samples, or info about purchasing the CD if interested.